Thanks to everyone who braved the weather and attended the course preview! Thanks to Frank & Tony's for hosting our sweaty runners once again! The 2016 Downtown Willoughby 5k will once again have a course preview run followed by drinks and food. It's always nice to get out and run a course before race day. It's even better if that preview run ends at a bar. On August 11th, we'll have a course preview run followed by a pizza party at Frank & Tony's. Frank & Tony's has been generous enough to provide free pizza for our runners and your first drink on the house. You must be registered for the race to take part in the course preview party. This is not a race, so the pace will be nice and comfortable. Due to the Willoughby Concert in the Park, we will meet and start the run from the Tech Center, rather than Erie Street and end at Frank & Tony's. It's a great opportunity to get together, get a general feel for the course and rehydrate with booze. Since roads will be open to normal traffic, along with the concert in the park, the course preview run will be slightly different than race day. We will start from the corner of Center Street and River Rd rather than Erie Street. View the map on Runkeeper here. Please use Todd Field to park and meet at the corner of Center Street and River Rd. We'll hand you a drink ticket for Frank & Tony's with course directions on the back. The course will also be marked with small arrows to keep you on track. Please join the Facebook event, so we have a general idea of how many runners to expect. 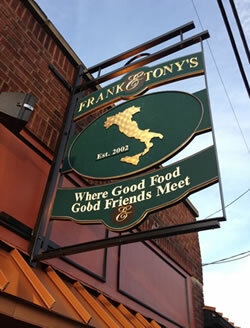 Thanks to Frank & Tony's for hosting our runners after the 2013, 2014, and 2015 course preview!